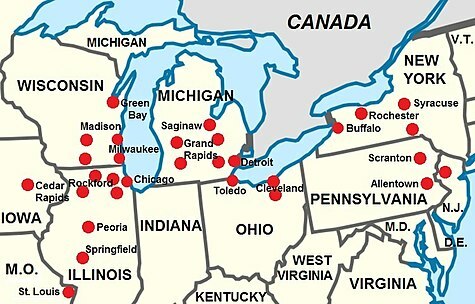 The dialect region called the "Inland North" consists of western and central New York State ( Utica, Syracuse, Rochester, Buffalo, Binghamton, Jamestown, Fredonia, Olean); northern Ohio ( Akron, Cleveland, Toledo); Michigan's Lower Peninsula ( Detroit, Flint, Grand Rapids, Lansing); northern Indiana ( Gary, South Bend); northern Illinois ( Chicago, Rockford); southeastern Wisconsin ( Kenosha, Racine, Milwaukee); and, largely, northeastern Pennsylvania's Wyoming Valley/ Coal Region ( Scranton and Wilkes-Barre). This is the dialect spoken in part of America's chief industrial region, an area sometimes known as the Rust Belt. Erie, Pennsylvania, though in the geographic area of the "Inland North," never underwent the Northern Cities Shift and now shares more features with Western Pennsylvania English. Meanwhile, in suburban areas, the dialect may be less pronounced, for example, native-born speakers in Kane, McHenry, Lake, DuPage, and Will Counties in Illinois may sound slightly different from speakers from Cook County and particularly those who grew up in Chicago. [ citation needed] Many African-Americans in Detroit and other Northern cities are multidialectal and also or exclusively use African American Vernacular English rather than Inland Northern English, but some do use the Inland Northern dialect, as do almost all people in and around the city of Detroit who are not African Americans. The shift, found throughout the Great Lakes cities, continues to exist today; however, recent evidence suggests a reversal of the shift in at least some of the Inland North,   such as in Lansing, Michigan,  and Ogdensburg and Syracuse, New York,   in particular with regards to /ɑː/ fronting and /æ/ raising (though raising is persisting before nasal consonants, as is the General American norm). The first two sound changes in the shift, with some debate about which one led to the other or came first,  are the general raising and lengthening (tensing) of the "short a" (the vowel sound of TRAP), as well as the fronting of /ɑː/ (the "ah" vowel of PALM and also, in most American English, the same as the "short o" sound in LOT), in the direction of [aː]. Inland Northern /æ/ raising was first identified in the 1960s,  with /æ/ coming to be articulated so that the tongue starts from a position that is higher and fronter than it used to be, and then often glides back toward the center of the mouth, thus producing a centering diphthong of the type [ɛə] or [eə] or at its most extreme [ɪə]; e.g. naturally /ˈnætʃɹəli/ as [ˈneətʃɹəli]. As for /ɑː/ fronting towards [aː], it may, for advanced speakers, even be close to /æ/—so that pot or sod come to be pronounced how a mainstream American speaker would say pat or sad; e.g. coupon /ˈkuːpɑːn/ as [ˈkuːpaːn]. ^ Gordon, Matthew J. (2005). " Vowel Shifting". Do You Speak American? MacNeil/Lehrer Productions. ^ a b McCarthy, Corrine (2010) " The Northern Cities Shift in Real Time: Evidence from Chicago". University of Pennsylvania Working Papers in Linguistics: Vol. 15 : Iss. 2, Article 12. ^ Labov, William (2008). " Yankee Cultural Imperialism and the Northern Cities Shift". PowerPoint presentation for paper given at Yale University, October 20, 2008. Online at University of Pennsylvania. Slide 94. ^ Castro Calle, Yesid. (2017). " German Echoes in American English: How New-dialect Formation Triggered the Northern Cities Shift". Stanford University Department of Linguistics (Undergraduate Honors Thesis). pp. 34, 48. ^ Castro Calle, Yesid. (2017). " German Echoes in American English: How New-dialect Formation Triggered the Northern Cities Shift". Stanford University Department of Linguistics (Undergraduate Honors Thesis). pp. 49. ^ Dinkin, Aaron (2017). " Escaping the TRAP: Losing the Northern Cities Shift in Real Time (with Anja Thiel)". Talk presented at NWAV 46, Madison, Wisc., November 2017. ^ a b Hillenbrand, James M. (2003). "American English: Southern Michigan". Journal of the International Phonetic Association. 33 (1): 122. doi: 10.1017/S0025100303001221. ^ Wawzenek, Bryan. " 10 Actors Who Always Show Up on the Best TV Shows." Diffuser.